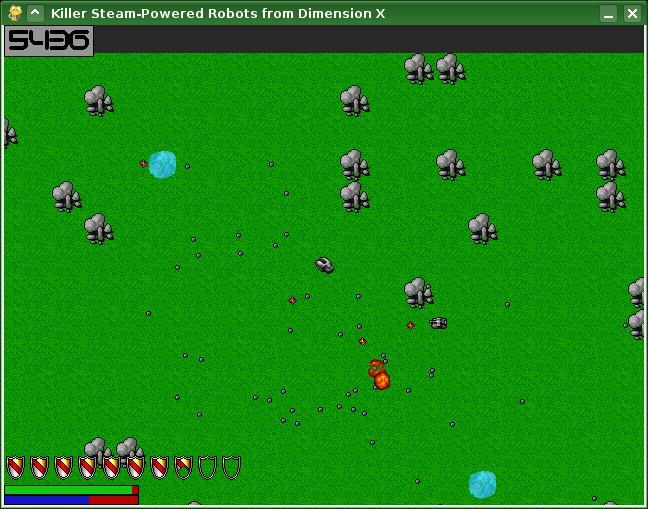 Killer Steam-Powered Robots from Dimension X is a simple arcade game. Shoot anything that's shooting at you, shoot trees to refill your fuel, and stand in pools to refill your water. Game has been tested on Linux and Windows. Under the GPL. Written in Python. Requirements: A recent version of Python and pygame. Minimum requirements are unknown, but should be reasonable. This version adds mouse support, and a couple minor features. You are a steam-powered machine living in the wilderness. You need to find and "eat" trees for fuel, and drink water for the water part of steam. Of course, there are also enemies around; you may want to attack them, which will give you metal, which can be used for upgrades. I hae graphics for grass/trees/water already (from a rogue-like tileset; used in Dragon Hunt), but nothing mechanical. I plan to use the "Hard Vacuum" tileset posted on the Pyweek forums for this. End of day 1: Saturday. I've got the interface and colision-detection working, but no real game yet. Still, you can run around and bump into rocks. End of day 2: Sunday. Real life interfered, so I wasn't able to get much done. Still, you can now fire, and destroy rock/trees. You can also loose the game, via running out of water or wood. End of day 3: Monday. This is an actual game now. New this day are the enemies, the cool explosions, your score, and metal. Metal is actually useless until I get the uprade screen done, (ETA: Tuesday) but the game is actually playable. End of day 4: Tuesday. I've got the upgrade system working. Also, trees regenerate, so you can keep playing indefinitely. End of day 6: Thursday. I forgot to update on Wednesday. Anyway, there are now multiple levels of enemies; the higher levels are faster, stronger, and tougher. The main menu system is new, and I've balanced the game a bit, as well as fixed a few bugs. Final version. This has two modes to play with, Upgrade and Endurance.